Who is KJ Apa, His Age, Height, Girlfriend, Parents, Net Worth, Is He Gay? KJ Apa is an actor who has risen to fame thanks to his appearance in the soap opera Shortland Street and the drama series Riverdale. Starting his career only in 2013, Apa has done quite well for himself within a very short while with a number of strong appearances that are helping him carve his own place on screen. Even though it is simply as KJ Apa that the actor is very popular, he was actually born Keneti James Fitzgerald Apa on June 17, 1997, in his home country of New Zealand, Auckland. His father, Keneti Apa is a traditional chief of Samoans and his mother Tessa Apa is a European New Zealander. He was brought up alongside two older sisters. Before he began his acting career, he went to the King’s College in Auckland where he was educated. He grew up loving the guitar, which is something that he still plays in his free time even though he has no interest in pursuing a musical career for now. Also, he was an athletic kid who played rugby. Another thing that he loves is shooting. In 2017, he got involved in a minor car crash which was said to have occurred whne he fell asleep after shooting. Former rugby union player and coach, Michael Jones is his uncle. KJ Apa’s first role as an actor came with an appearance in Shortland Street in 2013 as Kane Jenkins. After that, he got the role of Jack in The Cul De Sac in 2016 and then his real big break came when he got his role in Riverdale in 2017 as Archie Andrews. Apart from the series, he has also appeared in a number of movies such as A Dog’s Purpose in 2017, Altar Rock, The Hate U Give in 2018, and The Last Summer in 2019. The talented AJ Apa has got a number of nominations for his role in Riverdale such as the Teen Choice Awards and MTV Movie & TV Awards. He was awarded the Saturn Awards for Breakthrough Performance in 2017 for the same role. KJ Apa is not necessarily that actor with too many movies to his name, but thanks to some big roles that he has starred in, the New Zealand actor has amassed for himself a good fortune. He has a net worth that is estimated at $3 million most of which he made from his career as an actor. Parents and Girlfriend – Is he Gay? As already stated, the father of the actor is the chief of his village and his mother Tessa is a writer. She wrote and published a book, Cake in 2011 and is also into poetry, something she always shares on her social media handle. His parents brought the actor and his siblings up in Auckland where they still live. Living in New Zealand for the most part of his life, KJ Apa is not the most confident when it comes to talking to women. Comparing men in the US to those in his country, the actor revealed that men in the US are more confident and moving over has increased his confidence. Although there are some that assume he is gay, he is not as there is no proof to support that. In fact, he has revealed that thanks to his accent, his chances of getting a girl in the States has gone up by up to 50 percent. One of the things not known about him is his relationship status. Nonetheless, he has been linked to a number of women in the past including Riverdale co-star, Camila Mendes. About that, he revealed that the two of them are only friends while admitting that things would be weird with someone one doesn’t know well, which is not the case with Mendez. See Also: Masiela Lusha Bio, Age, Husband, Net Worth, Where Is She Now? 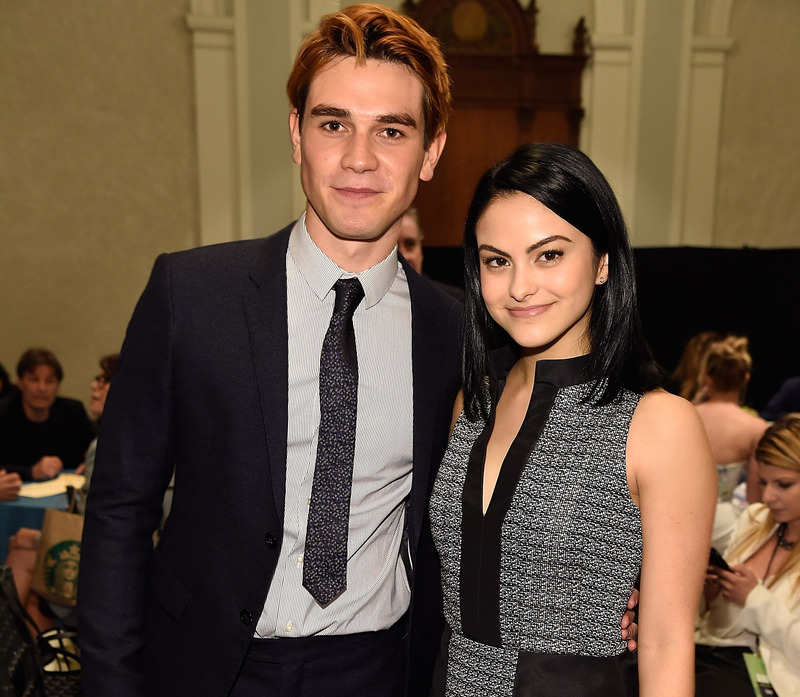 In January 2018, KJ Apa was rumored to have a girlfriend who was at the time, 16 years old from Canada. The actor was spotted on his way to Vancouver with the said girlfriend whose name is given as Corinne Isherwood. Apart from that, they have been spotted at a party together with some sources claiming that the two have been dating since 2017. However, it is still yet to be confirmed if they are actually dating. As regards his height, while KJ Apa may not be the tallest man that you will see on a set, he still has a very good height standing at 5 feet 11 inches (180 cm) tall. More so, Apa has a weight of 73 kg.